2009 Triumph Bonneville T100. Picture credits - Triumph. Submit more pictures. Like all 2009 Bonnevilles, the T100 benefits from the latest incarnation of Triumph�s legendary 865cc parallel twin, which is now fuel injected. This bike will not only stop people in their tracks, but with disc brakes front and rear, it will stop you nicely too. This is without a doubt a modern motorcycle for the classic rider. Ask questions Join the 09 Triumph Bonneville T100 discussion group or the general Triumph discussion group. Bikez.biz has an efficient motorcycle classifieds. Ads are free. Click here to sell a used 2009 Triumph Bonneville T100 or advertise any other MC for sale. 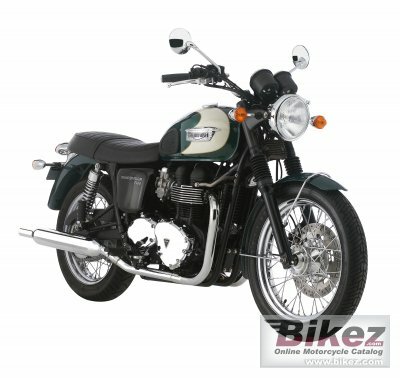 You can list all 2009 Triumph Bonneville T100 available and also sign up for e-mail notification when such bikes are advertised in the future. Bikez has a high number of users looking for used bikes. Before you buy this bike, you should view the list of related motorbikes Compare technical specs. Look at photos. And check out the rating of the bike's engine performance, repair costs, etc.